I know everyone loves the 4000 footers of New Hampshire, but I’m seriously falling in love with the little hikes of New England. We truly haven’t had a bad one yet and I’m kind of shocked it’s taken me this long to get around to some of these mountains. I mean, really – how does a stunning 360 view of western New Hampshire on a bluebird day sound? Perfect. I thought so. 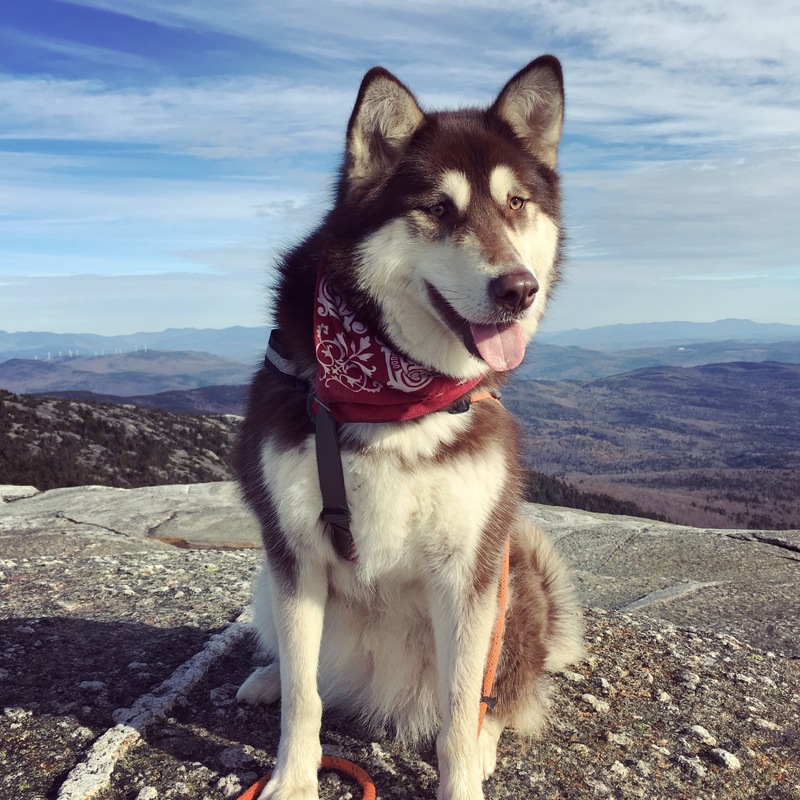 After recently meeting another couple with a love of small hiking and dogs, we decided that Mount Cardigan in Orange, NH was the perfect way to see how all the pups got along. Spoiler: Kina has a new best friend named Keeley and Yuri thinks 12 year old Australian cattle dogs are surprisingly agile. 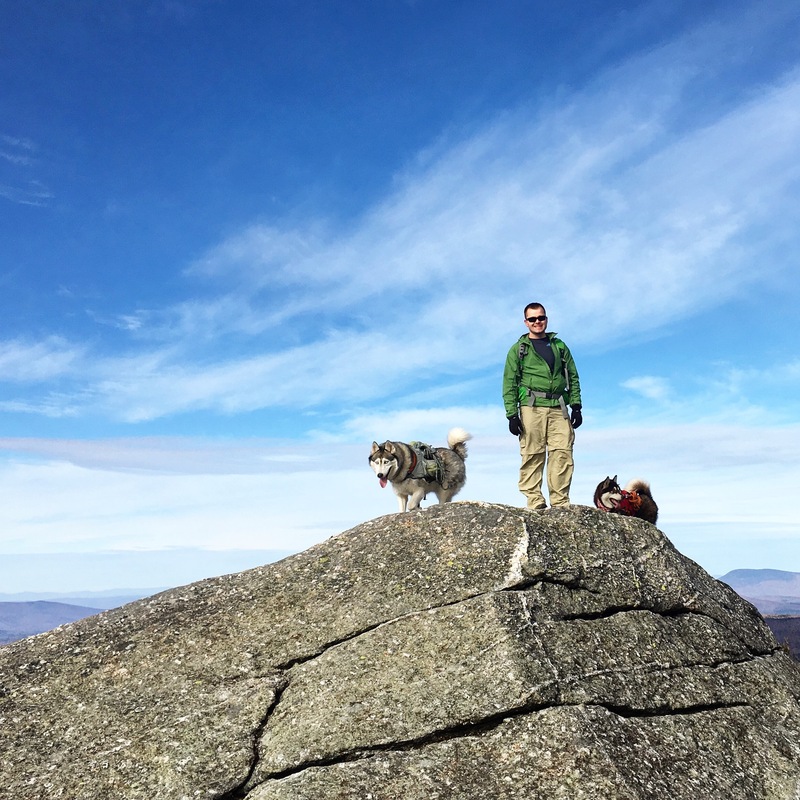 So what should you know about Mount Cardigan? I’m going to have to kick this off with the irony that we spent more time getting to this hike and back, than actually hiking. From Manchester, it’s a solid 1.5 hours to the trailhead straight up 93 North and then on to 89 North. It’s a really easy drive, and yes – there’s reception the entire way. The more we hike, the more I’m realizing that New Englanders grade hikes like we grade rock climbs and ski trails. Logic? What logic? Mount Cardigan is ranked “moderate” but given that Table Rock’s is also ranked moderate, I’m not so sure. We chose to take the West Ridge trail which is a 3.0 mile roundtrip route (1.5 mile up and the same back). For the most part, the trail is one of the easiest I’ve ever hiked with gentle inclines and plenty of flat sections. The top is a different story and maybe that’s where the moderate comes in. Mount Cardigan is one of NH’s “bald peaks” meaning that it has an entirely exposed peak – no dirt, trees, etc. It’s definitely a bit steeper up there and the addition of ice slides certainly made for a little bit of a challenge, but still super easy. This trail was incredibly dog friendly and I’d definitely recommend it for canines and their humans looking to break into the world of hiking. 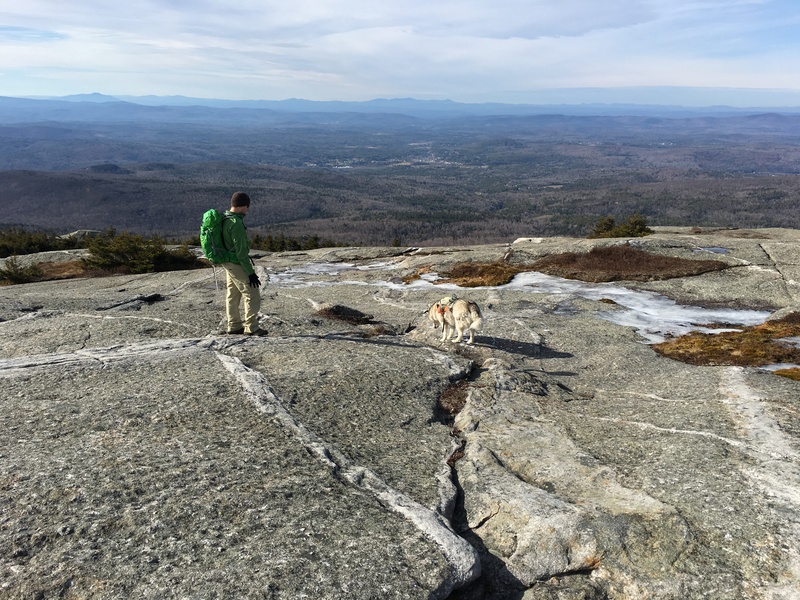 Unlike a lot of the other hikes we’ve done recently, this one didn’t have any terrifying ledges and cliffs – so it’s perfect for dogs and kids. We should note that the peak is really exposed, so please use extra caution when it comes to weather. There is nowhere to hide in case of thunderstorms, high winds, or snow storms. Please be smart about it! So how does Yuri and Kina rate the mountain/trail for hiking? One or two dog paws? I think this one got two paws. Lots of diverse terrain, ice to slide on, puddles to jump in, and mud!